One of a set of five stamps issued on 6th August 1996 by Royal Mail Mint Stamps, commemorating Women of Achievement: the theme of a Europe-wide stamp celebration in 1996 - featuring five women who have died in the last decade. 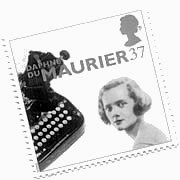 Also commemorated were Dorothy Hodgkin, Margot Fonteyn, Elisabeth Frink and Marea Hartman.The design is by Stephanie Nash, Michael Nash Associates, printed by Harrison & Sons Limited.The Daphne du Maurier portrait was courtesy of The National Portrait Gallery, London; the typewriter courtesy of the du Maurier Room at Jamaica Inn. Further details about British postage stamps and philatelic facilities can be obtained from: British Philatelic Bureau, FREEPOST, 20 Brandon Street, Edinburgh EH1 0HN, Scotland.